Reviewer's Note: This is going to be a little different from previous fantasy reviews, simply because I read this book a bit of a while ago, and I wasn't able to review it due to work, NaNoWriMo, and general Life Stuff. So I'm running on memory! So the first book of this series, Dragon Keeper, didn't wow me, but Dragon Haven blew me away with how easily it fixed the problems with the first book, advanced the plot, and developed the characters. 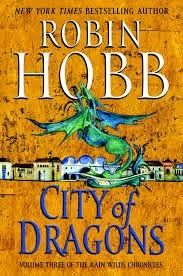 My expectations were pretty high for City of Dragons. Unfortunately - it's a bit of a filler book. Scratch that, it's entirely a filler book. The plot moves forward a couple of inches, but otherwise, it's entirely a set-up to what is presumably the final book in the quartet, Blood of Dragons. The dragons and their keepers have finally reached the fabled Elderling city of Kelsingra. The only problem? A wild, uncrossable river stands between them and their destination, and the only dragon who has successfully crossed it is Heeby, the first dragon to master flight. If the other dragons want to reach the city and unlock its secrets, they'll have to force themselves to learn to fly or remain trapped on the rain-drenched shore. This is especially difficult for the arrogant, intractable dragon Sintara. Her first attempt to fly ended very badly and she's too proud and vain to admit that she's terrified of trying again. Another issue arises regarding the fate of Kelsingra. Alise wants to preserve the Elderling city exactly as it is, to research it and finally discover the secrets of the Elderlings and why they disappeared. On the other side of the issue, Rapscal and some of the other keepers want to actually use the city and its contents rather than protecting it like a dead relic. On top of that, once the existence of Kelsingra becomes publicly known, it'll only be a matter of time before treasure hunters descend to try and wrest it from their grasp to sell it piece by piece. Hobb also grooms more characters to become future antagonists (such as the Duke of Chalced and Alise's Evil Gay Husband Hest) and explores more on the theme of female sexuality, but otherwise, the story doesn't progress terribly far. I'm still looking forward to the final book, but perhaps my expectations will be more tempered this time. Video Game Review: "Dragon Age II"